Over the last 10 years Underground Oil Tanks have become a big problem in New Jersey! This is one reason why many attorneys request an oil tank search, scan or sweep prior to the sale of a property. This is especially important with homes more than 30 years old. Similar to lead paint, the older the home, the higher the likelihood it exists on your property. A sellers' disclosure is often not helpful because it asks the wrong question. It asks the sellers, "Are you aware of any abandoned tanks on the property." It doesn't ask them, "Are there any abandoned tanks on the property" which is what you need to know! At Polo & Associates, we utilize the newest and state of the art, 2 box detectors the industry has to offer! They are specifically designed to find buried tanks and utilities. We may even uncover an abandoned septic system or well during our inductive search which can be very useful also. The rate for this service may also be discounted when it is performed during our home inspection. 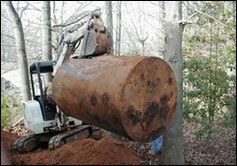 Underground oil tanks can be a very costly issue and should be tested and insured or removed. Polo & Associates uses New Jersey testing services that exceed US EPA requirements as well as state environmental agency requirements. The two part oil tank test consists of placing an electronic probe in the fill tube and down into the oil. This tests if petroleum has leaked out or if water has seeped into the tank. The empty portion of the tank is monitored by ultrasonic waves to detect any holes that may exist. This test for an active tank is usually more effective and less expensive than soil sampling. The testing technology is the most recent state of the art and no dangerous pressure testing procedures are utilized. Soil sampling is recommended especially for any inactive/abandoned tank or a foreclosure situation. We should have your results within 1 hour and should be able to deliver your report and certification shortly thereafter. I highly recommend Dave Polo of Polo and Associates. Dave provides an excellent buyer's service. He has proven to be knowledgeable, honest and reasonably priced. Although a seller or a seller's agent may not be pleased with potential issues he may uncover, for a buyer, his service is worth every penny. For more information regarding our Oil Tank Tesing rates and services, give POLO & ASSOCIATES a Call Today at 866-225-7656 or click the link below to schedule an inspection!